Texture ~ Adding a third dimension! In my latest painting, Windswept, I intentionally added texture where I could to give the painting added interest. Usually I produce a fairly smooth painting surface, but this time I thought it would not only be fun to use a palette knife and apply thick paint, but it could very well enhance the painting. The idea came to me because of the windblown upper feathers of the Brown Pelican, which create a ruffled appearance. Texture in oil painting can evoke a feeling of wanting to reach out and touch the surface. It pulls you into the painting. Beyond that, the raised edges, if applied judiciously, can catch the light and add a sparkle or a highlighting affect. It also can be used to create a sense of depth; to bring objects forward and make them stand out. 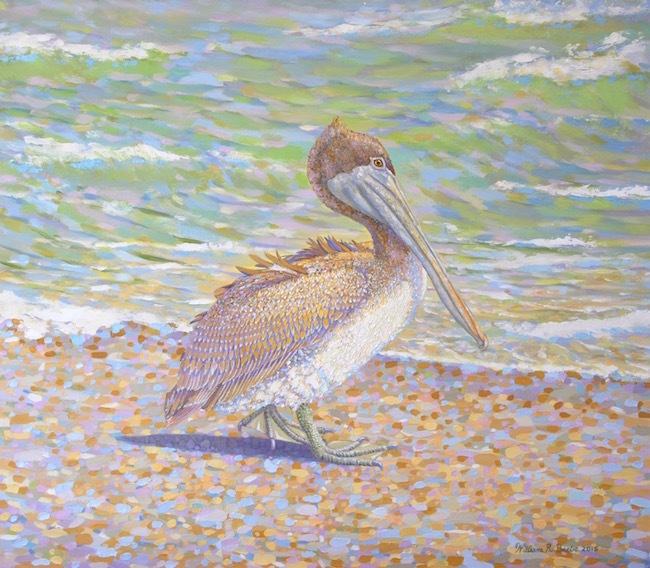 I used this technique on the feathers of the Brown Pelicans in my painting Balancing Act, and the effect was what caught the eye of the buyer. The texture in the Pelican’s feathering was also challenging. Careful thought was given to the angle of the palette knife with each application of paint, in order to put the highlight on one edge of each feather. Where the feathers become smaller, the palette knife is a great tool for implying feathers. It allows you to put little, clean dabs of color where many times painting the same feathers with a brush will become muddy. With the water I used brushes to create the smooth water’s surface and a palette knife to create the action in the waves. I love the versatility of oil painting. Oil paintings range from glass-like glazed surfaces to thick impasto, with an unbelievably wide range of techniques in-between. Personally, it allows me to take on each new painting with enthusiasm. I never get bored because even if I were to have to paint the same bird over and over, there are so many ways to paint him with oil paint. My first art class in college was an oil painting class and I’ve been painting with oil paints ever since. A little tip for those of you who are artists and want to apply the paint a little more thickly than usual is to add Flake White paint into your mixture. Flake White is a heavy, lead-based paint, which when mixed in with other colors helps create a buttery, thicker paint than what comes out of the tube.